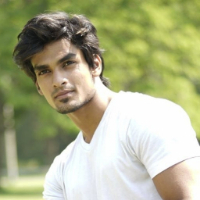 Sagar Sengupta started modeling while he was pursuing his B Tech from UPES, Dehradun. He has been working as freelance model since 2016. He has also started his own fitness training business in the year 2017. A model is a person with a role either to promote, display or advertise commercial products(notably fashion clothing), or to serve as a visual aide for people who are creating works of art or to pose for photography. "I started modeling while I was pursuing my B Tech from UPES. I have been working as a freelance model since 2016." Buliding a physic is just one part of fitness training. Fitness is more than that. It includes nutrition, flexibility, includes muscle strength. "I have done Engineering in Mechatronics from UPES. I wanted to follow passion in Fitness so after completing my graduation, I started my own finess training company called Trade Meal Pvt Limited."